The 2010 Native American Dollar features a new design to symbolize the five nations of the Iroquois Confederation. This will continue the series, which features annually rotating reverse designs celebrating the accomplishments and contributions of the Native American people. The reverse design for 2010 features the Hiawatha Belt, which is a visual record of the creation of the Haudenosaunee or Iroquois Confederacy. The central figure on the belt, the Great White Pine, represents the Onondaga Nation. The four squares represent the Mohawk, Oneida, Cayuga, and Seneca Nations. The Belt encircles a bundle of five arrows to symbolize the strength and unity of the Confederacy. The reverse inscriptions include “United States of America”, “Haudenosaunee”, “Great Law of Peace”, and the denomination “$1″. The obverse of the coin features a portrait of Sacagawea. This image will be used for the obverse of each coin in the Native American Dollar series. 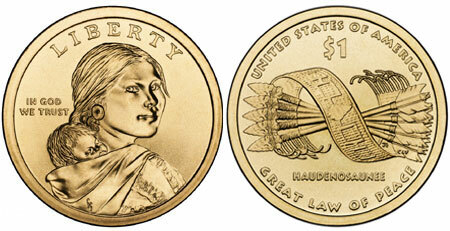 It was originally used on the Sacagawea Dollar coin series, issued from 2000 to 2008. The 2010 Native American Dollars were first released on January 4, 2010 through the United States Mint’s Circulating Dollar Coin Direct Ship Program. The coins could be purchased at face value in $250 quantities for the purpose of introducing the coins into circulation. The US Mint later offered individual 25-coin rolls through their numismatic rolls program on January 22, 2010. A launch ceremony for the 2010 Native American Dollar was held on January 25, 2010 at the Smithsonian’s Natoinal Museum of the American Indian in New York City.